Obtain a 1/10 oz 2013 Chinese Panda PCGS Ms-70 gold coin at the lowest price online, guaranteed! The gold Chinese panda series coins are regularly some of the most popular and sought after bullion coins available on the market today. The 2013 rendition is no exception. 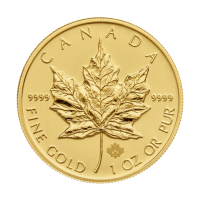 This 999 fine gold coin has been designated an MS-70 rating by one of the foremost authorities in the coin grading industry; PCGS. 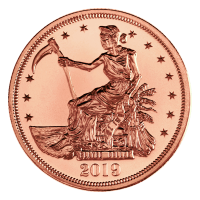 An MS-70 designation ensures that the coin that you receive will be in near perfect state, and encapsulated in a protective slab. The reverse of the 2013 panda gold coin features three pandas enjoying a drink of water with a bamboo forest behind them. Also on the reverse side, is the coins denominational value in Yuan and its weight. The obverse depicts the Hall of Prayer for Abundant Harvests in the Temple of Heaven in Beijing, which is a UNESCO heritage site and an extremely symbolic landmark in the nation of China. 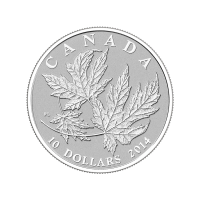 The coin is a highly liquid investment, due to its MS-70 grading and high gold content. 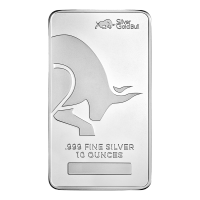 Stack your wealth in ounces with this great addition today! 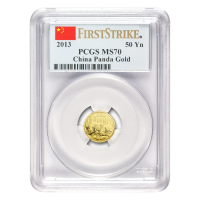 1/10 oz 2013 Chinese Panda PCGS First Strike MS 70 Gold Coin Obtain a 1/10 oz 2013 Chinese Panda PCGS Ms-70 gold coin at the lowest price online, guaranteed! 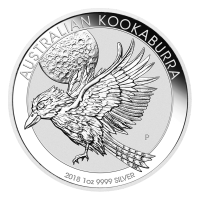 The gold Chinese panda series coins are regularly some of the most popular and sought after bullion coins available on the market today. The 2013 rendition is no exception. This 999 fine gold coin has been designated an MS-70 rating by one of the foremost authorities in the coin grading industry; PCGS. 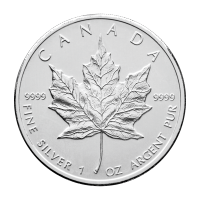 An MS-70 designation ensures that the coin that you receive will be in near perfect state, and encapsulated in a protective slab. The reverse of the 2013 panda gold coin features three pandas enjoying a drink of water with a bamboo forest behind them. Also on the reverse side, is the coins denominational value in Yuan and its weight. The obverse depicts the Hall of Prayer for Abundant Harvests in the Temple of Heaven in Beijing, which is a UNESCO heritage site and an extremely symbolic landmark in the nation of China. 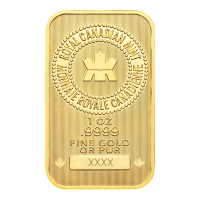 The coin is a highly liquid investment, due to its MS-70 grading and high gold content. 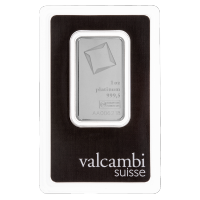 Stack your wealth in ounces with this great addition today!